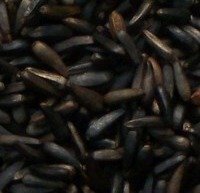 Nyjer Seed (aka niger seed or thistle seed) is a teeny-tiny, high-oil content seed (~40%) mostly favored by finches and siskins. In order to eliminate waste, there are special thistle feeders with very tiny holes as feeding ports. Nyjer bird seed is an oilseed crop from the yellow flowering plant, Guizotia abyssinica (pictured), that is cultivated in Ethiopia, India, Myanmar and Nepal. This "thistle" is sometimes confused with the North American noxious pink/purple-flowered weed. No worries! This is an entirely different plant and is heat treated as an import condition so that it can't sprout. "Nyjer" is is a trademark of the Wild Bird Feeding Institute. A name change to eliminate product confusion and the offensive mispronunciation of the word niger. That Nyjer Thistle Seed is the only imported seed in the bird feeding world. Sure it costs a bit more, but if you are looking for a "finch frenzy" at your feeder, buy some pure Nyjer seed today.